Dylan Thomas is one of my favourite poets. He is another icon of male decadence, also Welsh - hmmm, must be something in the water - "shaken not stirred." If I were to pick a knitting pattern that exemplifies this creative "force" - call it Spring in the seasons, call it life in nature, call it creativity in the work of man - to knit, while waiting for the epiphany of Spring! 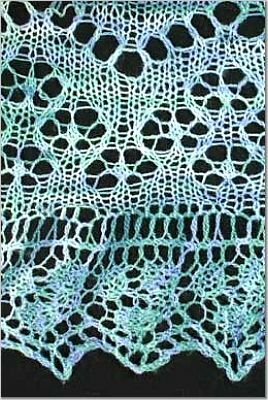 I would pick Dorothy Siemens' (Fiddlesticks Knitting) Garden Shawl. This is just my choice to-day. I know that there are lots of patterns to be knit while waiting for Spring - here is the place to share them! There is something, however, in the green Artisan yarn that Dorothy chose; something in the beautiful shetland patterns that she selected and definitely something in the flowing drape of the airy, diaphanous wrap, that whispers, no beckons Spring, as does the siren's song, with images of "glory in the flower and splendour in the grass." (2 skeins of green organic cotton to the first person who can post in the comments the title of the poem and the poet.) I know it was Natalie Wood and....... - anyone cotton up his name? in the movie - but the poem came first! I asked Dorothy if she would be willing to share her experiences designing The Garden Shawl and she graciously accepted. Here are the designer's own words. Also a big thank you to David - Mr. Fiddlesticks Knitting for the pictures. 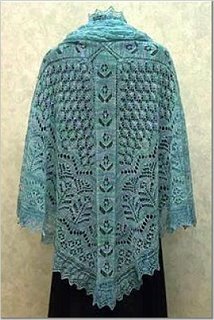 The Garden Shawl, one of my first lace designs, is also one of my most popular and enduring designs. What is it about this shawl that seems to strike a chord in so many people? I think this shawl works for a few different reasons, and if we could find a formula and put all those variations into each design we created, all of our designs would be best-sellers! First of all, it has great visual impact. A common reaction from people seeing this shawl for the first time is an indrawn breath or gasp, followed by comments such as, "This is just gorgeous," or "I would never be able to knit something like this!" There is a reason why traditional Shetland lace shawls (and this shawl uses mainly traditional Shetland lace motifs) are forever popular, and that is that the lace itself is so beautiful. 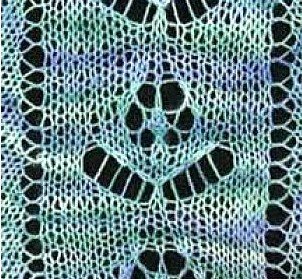 It is difficult to design something unattractive with traditional Shetland lace. Furthermore, the particular motifs I used are so appealing. I find that people like shawls and scarves with themes. 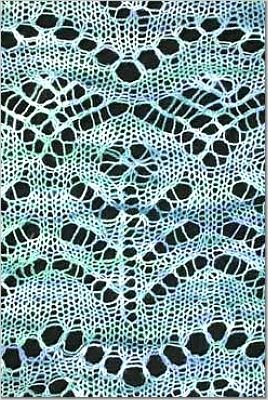 The Peacock Feathers Shawl (my very best-seller to date), Creatures of the Reef and Romance Shawl, for instance, have very recognizable imagery or themes that people can relate to. The flowers and leaves of the Garden Shawl are romantic, pretty and approachable. 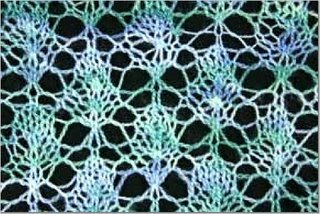 Even if the lace looks daunting to knit, people are eager to try, and enjoy seeing the motifs appear beneath their needles. I think that even the description on the pattern helps to lure people in: "Create a figurative garden as you knit this shawl. Stroll with your needles down the flower-strewn paths that frame drifts of leaves, ferns and flowery borders." Who wouldn't want to live in this dream world? 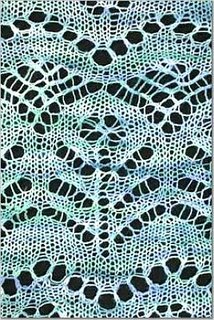 When I first conceived the idea for this design, I wanted to create a traditional Shetland lace shawl that did not follow traditional structure. I set certain parameters for myself. I wanted it to start in the middle and work outward in one piece, for ease of knitting. All the knitting is on the right side, so even though the lace is complicated and much of it is worked on every row, one is not having to work decreases on the purl side. Many shawls worked from the centre out form a square, with the increases worked along the diagonal lines of the square. I thought, why not divide those diagonal lines to create a sort of cross-which became my garden pathway with flowers growing in it. This flower motif was adapted from one I found in Sarah Don's The Art of Shetland Lace. You can see it in a photograph on page 100. I also adapted this motif for the flowers with stems that form the larger lace border near the bottom of the shawl. Other motifs that I used in keeping with the garden theme were the overlapping leaves, the zig-zag dewdrops, ferns, daisy clusters at the bottom, and the lacy leaf edging. Planning their placement took much swatching, some adaptation, and a lot of charting. Getting back to the visual impact of the shawl overall, there are another couple of reasons why it is satisfying to look at. It is interesting because of the contrast between the various elements. We have larger elements juxtaposed with smaller elements, busy elements against quieter ones, and open space against densely filled texture. There is also rhythm and flow, with the eye following the "garden path" in one direction, and the "dewdrops" around the shawl. The motifs interlock and fit together like a jig-saw puzzle, looking almost as though they were made for each other. Not everyone understands how to create a good or interesting design, but I think most of us respond positively, even on a subliminal level, when we see it. I like to think that the Garden Shawl creates this reaction in viewers, and of course, knitters, who have been so wonderfully supportive in response to my designs. Thank you so much, Dorothy, for such a clear, detailed explanation - so much thought, so much effort and the results are "sublime". Obviously a good part of creating a breathtaking knitting pattern is time, thought and effort. Dorothy's instructions and graphs are as carefully constructed as her description above. You are in for a very pleasurable experience, should you choose to knit The Garden Shawl. Please make sure that you are working from an original pattern. Support Art's enrichment of your life! Enjoy!